This classifier is a compressed air dry selection machine, with double air input and a horizontal centrifugal classifier rotor. Extremely resistant to wear and with an extended operational lifespan, the machine is suitable for the classification of fast-flowing materials. Fine or coarse powders can be produced with a high level of purity, even from substances which are not easily dispersible in air. The machine caters for a wide range of fineness, from d97=10μ. With a maximum operational capacity of 8 ton/h, the machine is often used in the cement industry. Different particles - spherical, flakes, fibres - can be separated; also materials of different densities. High level of fineness selection: d75/d25= 1,1/1,5. Good selection efficiency: Newton n=60–90%. The desired fineness of the product is easily adjustable. Assembly, maintenance and cleaning operations are extremely simple. Occupies very little space; extremely low vibration. May be used in conjunction with other grinding machinery to produce fine powders. 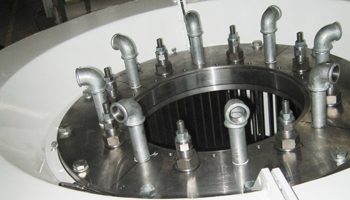 The material is introduced through a star valve in the upper section of the separator via a feeder. After passing through the valve, the product goes into the selection chamber where it is thoroughly classified by the horizontal selection drum. The coarse particles are thrown against the walls of the separator and slide downwards. The action of the ventilator's double air jet sends the mixture of fine and coarse powder back to the rotor for classification. 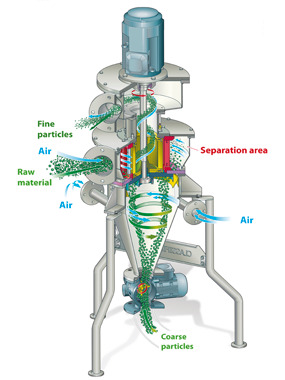 The coarse particles which have reached the bottom of the separator are discharged via a star valve, while the fine particles are sucked into an outlet tube for end product, passing through the selection drum. The tail gas is discharged into the atmosphere by a ventilator. For separation of minerals and chemical products in general; normally used in grinding plants for classification of products up-line from open-cycle mills, i.e. with no separation of fine and coarse particles at the outlet. 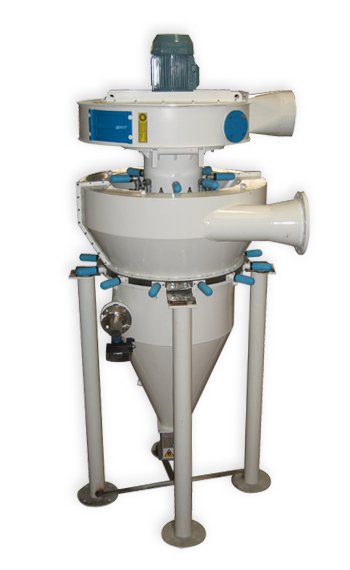 The classifier mill allows different particle sizes to be separated by granular selection, taking off the fine portion and returning the coarse to the grinder. High selection capability, giving a yield of up to 70% fine particles. Compact design with limited weight and little space needed. Minimal operational wear, so low product contamination with metallic particles.